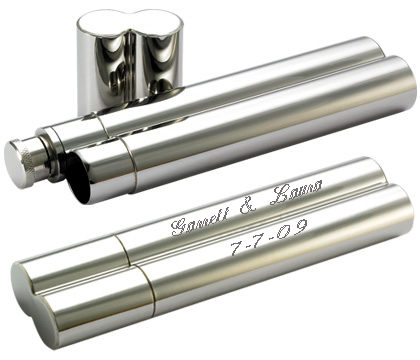 This high polished stainless steel double barrel flask and cigar holder combination is a wonderful gift for the person that enjoys a fine cigar with their drink. Both barrels can be engraved with a name, initials or message to make it a personalized gift for that someone special. Don't forget to check out A & L Engraving's complete selection of pocket sized gifts, including business card holders, zippo lighters, pocket knives and money clips.